A novel which begins with an Indian fishing village and the Dutch traders who first carved out their hopes amidst the splendour of the wilderness. It tells about the British settlers and merchants followed, with their aristocratic governors and unpopular taxation which led to reb... read full description below. Edward Rutherfurd tells the story of this great city as no other author could - from the epic, empty grandeur of the New World to the skyscrapers of the City that Never Sleeps, from the intimate detail of lives long forgotten to those lived today at breakneck speed. The novel begins with a tiny Indian fishing village and the Dutch traders who first carved out their hopes amidst the splendour of the wilderness. The British settlers and merchants followed, with their aristocratic governors and unpopular taxation which led to rebellion, war, the burning of the city and the birth of the American Nation. Yet a country that had already rent itself asunder once did so again over slavery. As the country fought its bloody Civil War, the city was torn apart by deadly riots. Hopes and dreams, greed and corruption - they have always been the companions of freedom and opportunity in the city's teeming streets. As the immigrant ships berthed next to Ellis Island in the shadow of the Statue of Liberty, they poured more and more Germans, Irish, Italians and Jews into the churning ethnic mix of the city. Deals were struck, politicians corrupted, men bought or assassinated, heiresses wooed, fortunes were speculated on Wall Street and men became rich beyond the dreams of avarice. The heady seesaw of wealth and poverty was seen in the Roaring Twenties and the Great Crash, the city's future symbolised by its buildings which literally touched the sky: the Empire State, the Chrysler Building, the Twin Towers. Rutherfurd tells this irresistible story through a cast of fictional and true characters whose fates interweave in the rise and fall, fall and rise of the city's fortunes. It is the story of how in four centuries New York became the envy of the world. 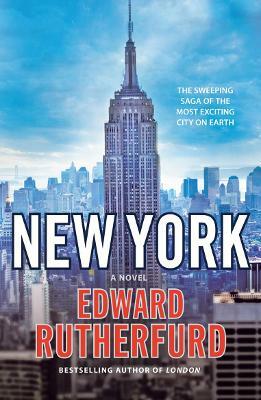 And in telling the story through the lens of New York , Rutherfurd brings the story of America itself to unforgettable life in this epic masterpiece. Edward Rutherfurd was born in Salisbury, Wiltshire, and educated at Cambridge University and Stanford University in California. His first book, Sarum was based on the history of Salisbury. London, Russka,The Forest, Dublin and Ireland Awakening all draw on finely researched details of social history. Edward Rutherford has spent much of the last 30 years living in New York and Conneticut. He has an American wife and two American educated children and has served on a New York co-op board.